Remembering the Battle of Britain – or not? Today is Battle of Britain remembrance day: 15th September; but when was it first celebrated as such? As early as 1942, there were official discussions as how – and whether – this tremendous achievement of the war should be officially remembered. Already the Battle of Britain was considered to be of huge importance to morale, and the courage and sacrifice of the young men who fought in the battle was already legendary, but opinion was divided as to how it should be treated. Nevertheless, a purely RAF ‘Battle of Britain’ day on 15th was ruled out, and it was deemed an appropriate celebration for the Service ‘if on that one day the flag were hoisted and parades were held’ at Royal Air Force stations and the Air Training Corps. The commemoration of the Battle in 1943 was therefore incorporated into what had already been designated ‘Civil Defence Day’, and which was now to be designated as a national ‘Day of Thanksgiving’. This took place with a service on the morning of Sunday 26th September, led by the Archbishop of Canterbury, with a parade in the afternoon outside Buckingham Palace at which the King would take the salute. A special hymn was written for the occasion. The same year the Eastern Chapel in the Henry VII Chapel of Westminster Abbey was designated as a memorial to the Battle of Britain: a private rather than a public tribute, financed by funds from a public appeal. A similar remembrance service took place in 1944, but again, on a nearby Sunday, not 15th September itself. Not until after VJ Day in August 1945 was it possible to hold the full-scale celebration of all that the Battle of Britain meant to the nation. 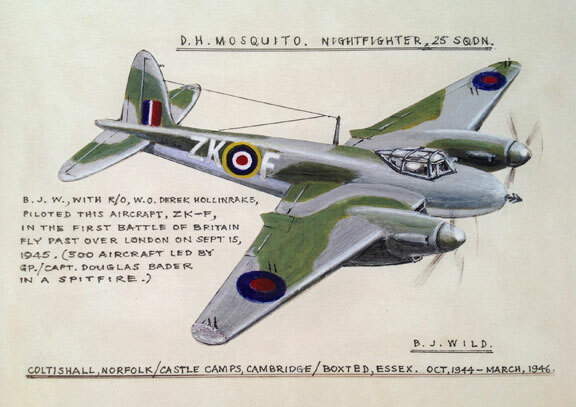 That is why, on 15th September 1945, my father, bursting with pride, took part in the very first Battle of Britain Remembrance Day flypast over London, in his Mosquito ZK-F for 25 Squadron, with 300 other aircraft let by Douglas Bader in a Spitfire. Today, as I see the greatest memorial flypast of recent decades, I will think of him, and wish he was here.